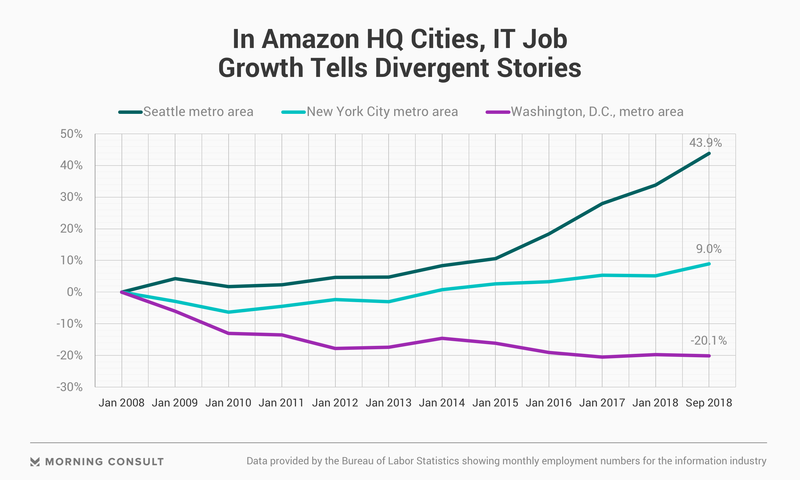 In NYC, government statistics show the tech-heavy information sector workforce grew almost 9% from January 2008-September 2018; in D.C., the workforce shrunk 20%. Yet, Washington’s tech jobs account for 8% of economy versus 3.8% in NYC, one report shows. New York’s Long Island City and Northern Virginia’s Crystal City, Pentagon City and Potomac Yard neighborhoods beat out 236 competitors to become Amazon.com Inc.’s dual second headquarters. But the startup tech communities in the two locales have markedly different feelings when it comes to the landing of the retail and tech giant on their doorsteps — and what it means for their own talent recruitment and retention. Both cities — which will see an influx of more than 25,000 Amazon jobs each and $5 billion in total investment — have key ingredients for a tech ecosystem, including an array of tech incubators and accelerators, venture capital firms and top-ranked university computer science and engineering programs. But Amazon decided to split its second headquarters between two cities to better recruit top talent to its company, Jay Carney, the company’s senior vice president of global corporate affairs, said in an interview with Bloomberg TV on Tuesday. Now we have this powerhouse coming in with probably some pretty attractive incentives for its employees. Ashwin Jayaram, chief strategy officer at D.C.-based Insomniac Design Inc.
By that metric, Washington, D.C. startups may have more to worry about. While both cities have a large pool of tech workers to draw from, New York City has surpassed D.C. in the growth of the workforce, which could present difficulties for companies seeking out talent. In the New York City metro area, the number of employees in the tech-heavy information sector has grown almost 9 percent from January 2008 to September 2018, according to the latest data from the Bureau of Labor Statistics. During the same time, the sector in the D.C. metro area has shrunk 20 percent. As a point of comparison, in Amazon’s hometown of Seattle, the sector has grown 44 percent. BLS defines information sector businesses as companies that process data, produce and distribute information and cultural products and provide means to transmit and distribute these products. A separate metric from commercial real estate group CBRE Group Inc. shows the Washington metro area has experienced a 1.3 percent decline in the total tech workforce from 2012-2017, while New York’s workforce has grown 17.2 percent in the same period. Washington’s economy also appears to be more reliant on its tech industry, with tech jobs accounting for 8 percent of its total workforce, according to CBRE’s data. In New York, tech jobs make up 3.8 percent of all jobs. Of course, despite the current workforce make-up in each city, Amazon could end up attracting additional talent to the area. In Arlington County, Amazon said it expects to offer an average wage of over $150,000 as part of its incentive plan. That compares to an average D.C. tech wage of $111,100, according to CBRE. And wages for startups are likely much lower. According to one measure, a census of more than 450 companies last year by D.C.-based startup community-building organization Fosterly, 54 percent of D.C. startup founders — let alone employees – earn $80,000 or less a year. In New York City, Amazon expects to offer the same average wage as in D.C. — which would be higher than 88 percent of salaries in current listings on Angel.co, a startup career hunting and investment website; the site calculates the average tech salary in the city as $104,000, based on its listings. For many D.C. startup players, the question isn’t just about base salary and compensation packages to recruit the best employees. It’s also the matter of adjusting salaries for the expected rise in living costs after Amazon touches down in Northern Virginia. The truth is that 25,000 jobs in New York, we’re not really going to feel it. “Right now, we’re already looking at the D.C. area as one of the more expensive areas to live in the United States. This is going to put some strain on that,” Ryan Croft, co-founder and chief operating officer of Washington-based transportation tech startup TransitScreen Inc., said in an interview on Nov. 8. TransitScreen, which shows real-time data for various public transportation options in places such as Metro trains and apartment lobbies and other locations, wanted an office space in downtown Washington that would allow most of its staff to take public transportation to work. New York City rent prices are already among the highest in the nation, sitting at around $4,000 a month on average, while D.C.’s rents are about $1,700, similar to prices in Seattle, according to CBRE. But tech entrepreneurs appear less worried about Amazon’s arrival in New York City, according to Julie Samuels, the executive director of Tech:NYC, a nonprofit advocating for the needs of local tech workers and companies. Samuels said that the city’s startup scene is better prepared for the influx of jobs given the existing slate of big-name tech companies already in the area. Samuels said the city’s tech talent pool could be restricted in the short term, since Google plans to double its presence in the city over the next decade to more than 14,000 workers, as Chief Financial Officer Ruth Porat said during a Wall Street Journal event Monday. But overall, the city will adjust after the dust settles, Samuels said. All companies, no matter the size, struggle with hiring the best people, she said. “But the announcement that Amazon will be here is actually good for small companies because not only will it create for opportunities to work in tech in New York, but I think you’ll see increased activity around local tech talent pipeline development,” she said. The Seattle experience has shown there’s some truth to both scenarios — as the growth of major tech companies in the city has been a mixed bag for startups, according to Eric Crawford, co-founder and managing partner at Seattle-based recruitment firm TalentReach. Smaller tech firms have struggled to compete on compensation and benefits with large corporations, including Amazon and Microsoft Corp., he said in an interview Monday. I’m somebody who is committed to D.C. long term. ... As someone who loves this tech ecosystem, I think this is also great for us. To attract top talent, startups rely heavily on a classic startup job pitch: the promise that employees will have more say in the company’s product. But he said the growth of Amazon and other large tech companies in the region has created a more sophisticated tech talent pool. “They increased the actual technical bar that the rest of the startups actually now adhere to,” he said. Amelia Friedman, chief operating officer and co-founder at Washington-based software startup Hatch Apps, said Amazon arrival makes her team nervous about competing for top talent, at least in the short term. But looking at the bigger picture, she has reason for optimism.